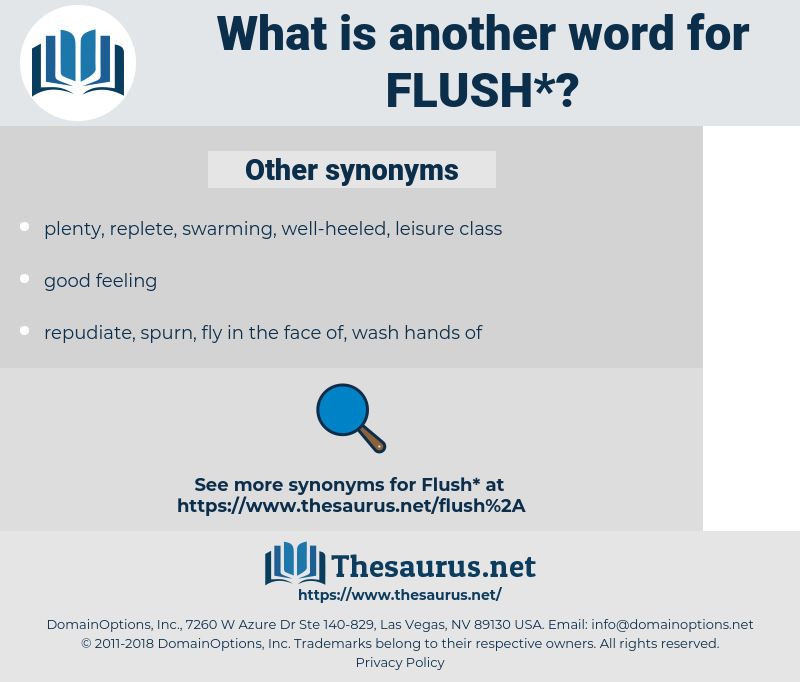 What is another word for flush? lay, cleanse, dump, brush, pull. aligned, backwash, purge, hunting, empty. scramble, throw, shoot, purge, empty. dishonest, vertical, rough, uneven, upright, broken, irregular, lacking. impoverished, economical, wanting, thrifty, poor, needy. disabled, invertebrate, impecunious, unsmoothed, feeble, decrepit, bloodless, faint, severed, indebted, waxen, Sallowish, split, sickly, exhausted, pinched, Bankrupted, sluggish, debilitated, detached, isolated, worn-out, isolate, Pocky, broken-down, torpid, effete, far, single, faraway, tired, delicate, straitened, enervated, spineless, divided, discrete, Unyoked, insolvent, frail, waxy, pockmarked, listless, farthest, drained, unaligned, remote, prostrate, depleted, noncontinuous, divorced, dissociated, Whey-faced, far-off, hand-to-mouth, impotent, weakened, lackadaisical, powerless, lethargic, unattached, wimpy, white, Undulatory, wavy, unlinked, apart, away, low, lazy, soft, sallow, whitened, indolent, resolved, disjoined, noncontiguous, disunited, removed, incomplete, nonadjacent, ruined, Dissevered, pitted, uncoupled, deficient, weak, discontinuous, reduced, wasted, infirm, short, anemic, languid, distant, palish, separate, Ramified, inexact, warped, parted, broken up, unconnected, mealy, nerveless, disconnected, insufficient, peaked, dull. Again the angry flush touched her cheeks. Again the wild - rose flush came and went - and again Burke Denby stepped nearer. 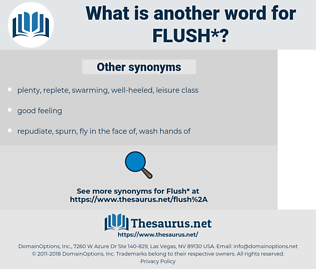 flush down, wash down, perfuse, suffuse. feed, course, water, run, irrigate, flow.